Shakir Mahmood claimed 4-30 for Ketton at Godmanchester. A double century opening stand helped Ramsey maintain a distant second place in Cambs Division One yesterday (July 15). Aussie Ryan Smith blasted a brilliant 124, while Jordan Cafferkey fell agonisingly three runs short of a ton as the Rams’ first-wicket pair put on 215 at struggling March. Jordan Cafferkey made 97 for Ramsey at March. Smith only faced 98 balls and struck 14 fours and three sixes. Cafferkey’s innings was far more patient, but he did club five sixes. Ramsey finished on 288-4 in their 50 overs before despatching March for 184 to seal a 104-run win. That man Smith (4-24) also starred with the ball, but Ramsey remain 50 points behind unbeatable leaders Ketton. The Lions made it 12 wins in 12 games with a five-wicket success on a tricky track at Godmanchester. Shakir Mahmoood (5-30) and Iresh Saxena (3-17) enjoyed themselves as Goddy were shot out for 100 as Ketton preserved their 50-point lead at the top. Wisbech lost ground in third as they went down by 51 runs at home to Foxton. Even Wisbech wizard Gary Freear (77) couldn’t save the Fenmen after they were set 237 for victory. Histon’s five-wicket win at Nassington was bad news for March who are now 33 points adrift of safety. Nassington had won their four previous top-flight matches, but a total of 168 proved inadequate. Conor Craig’s 55-ball 60 proved in vain for the home side. Castor and Ufford Park both went down to teams battling against relegation in Division Two. 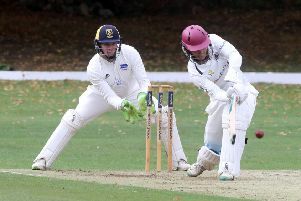 Castor lost a tight game by two wickets at Cambridge St Giles despite 67 from Stuart Dockerill, while Ufford batted poorly on their way to a five-wicket reverse at Granta seconds. Godmanchester 100 (A. Cousins 30, S. Mahmood 4-30, I. Saxena 3-17). Ketton 101-5 (Z. Manzoor 27no, T. Sole 26, E. Baldwin 4-13). Ramsey 288-4 (R. Smith 124, J. Cafferkey 97, T. West 25no, A. Wright 2-30). March 184 (J. Hilliard 72, B. Phillips 26, B. Pyle 25, R. Smith 4-24, K. Ikhlaq 2-10, E. Cafferkey 2-43). Nassington 168 (C. Craig 60, T. Norman 26, C. German 3-17). Histon 172-5 (W. Brown 84, T. Norman 3-61). Foxton 236 (A. Webster 88, C. Park 72, B. Ellis 3-38, G. Freear 3-55, K. Haynes 2-31). Wisbech 185 (G. Freear 77, P. Patel 31, J. Douglas 4-25). Ufford Park 161 (J. Corder 46no, E. Cox 24, A. Larkin 23, H. Rashid 4-41). Granta 165-5 (M. Aubrey 42, R. Keymer 2-32). Castor 188-8 (S. Dockerill 69, R. Porter 45no). Cambridge St Giles 193-8 (R. Evans 3-25, R. Smith 2-29).